Our members know a thing or two about change. They see how lives can move in any direction because they work where change happens. Addictions and Mental Health Ontario represents the organizations that provide front line care in our communities. 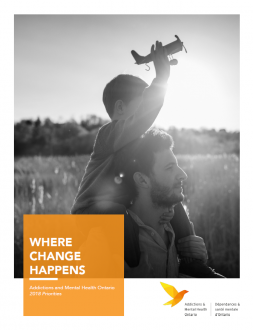 Over the last eight years, community mental health and addiction providers have continued to stretch resources and struggle with budgets in an unbalanced system. And as a result, Ontarians are unable to access the mental health and addiction care they need, when and where they need it. These services save lives and help people live a better quality of life. We must redress the historical funding inequalities that have made it challenging for people and families to access help for addiction and mental health problems. Most community agencies have faced flat-lined base operational budgets since 2009 or longer. Organizations are struggling to manage their hydro bills, food costs and keeping staff in a competitive market. 25% of AMHO members who responded to a recent survey said they had to lay off staff due to resource constraints and almost half said they left positions vacant for a period of time to manage budgets. Staff loss has a direct impact on client care. Relationships must be rebuilt, and unsurprisingly there is often significant attrition in a group programs when a mental health or addiction professional leaves. We must increase operational funding by 3.75% for the next four years, and match operational funding to CPI in the years following to ensure the long-term sustainability of community programs while better serving clients who are accessing services across the sector. The lack of high quality data in the community mental health and addiction sector creates an obstacle for good planning. Community mental health and addiction service provider’s attempts to implement reporting initiatives are regularly delayed, postponed or abandoned due to resource constraints. Without comprehensive data and a performance measurement strategy, providers cannot follow a client’s journey, gauge the performance of the system, build information infrastructure and capacity, and establish a comprehensive approach across the province. Access to better data will help serve more people. Organization could serve more people and be more effective if they had better information technology training and equipment, and staff dedicated to data analysis, decision support and quality improvement. We need to establish a data system with a robust technology network and the staff to support it. We recommend the government invest an initial $24 million in start-up costs over the first three years, followed by an annual $8 million for yearly operating costs. People across Ontario are waiting longer for mental health and addiction services. Hospitals report unnecessary emergency department visits from clients waiting months for the community-based services they need, and see the same individuals cycling both through the emergency department when they cannot access services and support. Community mental health and addictions service providers are regularly operating at a less than optimal staffing level, with staff at a great risk of burn out. Programs don’t help people, people help people. We could prevent the revolving door problem in our hospitals by hiring more mental health and addiction professionals to help people live successful, independent lives in the community. We need to hire more front-line mental health and addiction professionals. According to available data, hiring a minimum of 550 full-time employees a year for the next four years (such as community treatment staff, case managers, counsellors, social workers and assertive community treatment staff) would mean that each year, 28,000 more Ontarians could access the services they need. This would significantly help address the issues of wait times, and effectively serve those who are trying to access care at the right time and right place. Our health care system spends millions annually providing emergency room, emergency shelter and services to Ontarians with mental health and addiction problems who do not have secure housing. It costs $486/day to keep a person in a psychiatric hospital versus $72/day in supportive housing. 13,000 people are waiting an average of 5-years for one of Toronto’s 5,000 units of mental health and addiction supportive housing. People cannot recover without adequate housing. We need a minimum of 30,000 mental health and addiction units. This is the number cited in the 2015 Mental Health Leadership Advisory Council’s report. Ontario’s Homelessness Strategy aims to end homelessness in 10 years. We could reach both targets within 10 years if Ontario increased its funding commitment to supportive housing for mental health and addiction by a minimum of 20% or approximately 200 units per LHIN, per year.